A SHRM Senior Certified Professional and a Certified Professional Facilitator, Kimberly also holds a Master of Science in industrial/organizational psychology. Prior to founding FireFly twenty years ago, Kimberly was an organization effectiveness leader for Coca-Cola; a Director of Consulting with the Hay Group; and served in HR leadership roles in the healthcare, telecommunications, and hospitality industries. Are you “Putting Your Whole Brain to Work?” Kimberly will engage you in an interactive, fun and informative exercise, based on the world’s leading thinking styles assessment tool, the Herrmann Brain Dominance Instrument. Using techniques from her book, The Firefly Effect Kimberly will guide you through an interactive, fun and informative session – to learn more about your own thinking style and how to bring out the best thinking of others in each stage of the creative problem-solving process. 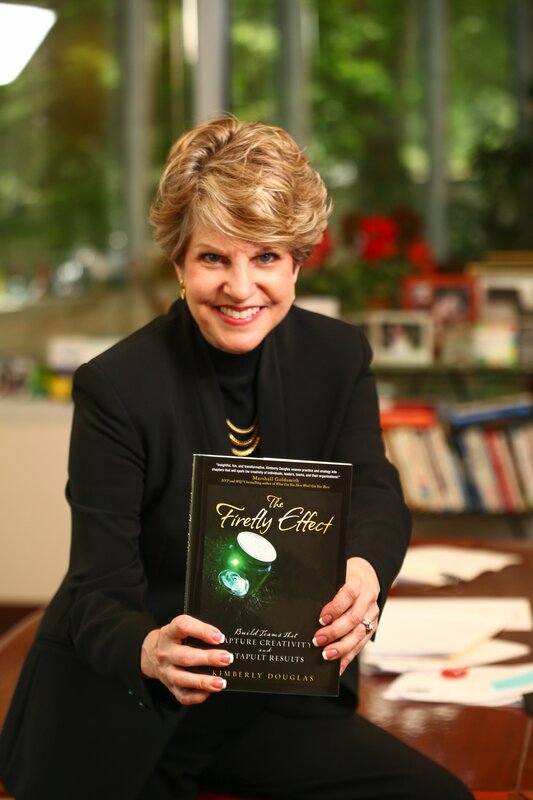 Based on Kimberly Douglas’ book, The Firefly Effect (Wiley), this engaging presentation will ensure that you have five proven strategies for making it happen in your company. Discover how to prevent leaders from keeping too tight a lid on the jar. Learn a proven process to search for untapped talent on your team. Know how to encourage productive conflict – aka “creative abrasion”. Learn essential design thinking techniques, mindsets and behaviors in a hands-on format. This 90-minute workshop teaches participants how to apply creative habits – such as user empathy and rapid experimentation – to innovate in a new way. An introduction of design thinking into your culture through a shared experience. Awareness of the tools and techniques of the world’s leading designers. A compelling case for putting customers/humans at the center of all problem-solving efforts. Understanding of how leaders can enhance and model innovative behavior. In this engaging innovation simulation session, your participants will be guided through the essentials of a four-month innovation project in a half-day or full-day workshop. As a result, your people will develop an awareness of and support for design thinking as an approach to problem solving. In the full day session, participants will have the opportunity to apply what they learned in the morning to creating a culture of innovation within the company, setting the stage for them to personally practice design thinking techniques every day post-session. Based on key insights from her book, The Firefly Effect (Wiley) and incorporating the most effective change management practices from John Kotter and William Bridges, Kimberly Douglas will engage your leaders in a process to recognize and overcome common organizational change management challenges. ExperienceChange Learn and Apply (One-Day) You’ll take a 12-month change journey in a single day. We pack 20 years of change research and industry insights into an intensive, high-impact workshop that leaves you seeing the world differently. ExperienceChange Jumpstart (Half-Day) For those who can only spare a half-day session, we recommend the “Play First” scenario for the training. The participants will take 3 hours to play the simulation with no introduction to change management and no training on the change model or the theory (only training on how to navigate the online simulation). We then conduct a large group debrief of their key learnings – followed by the opportunity to apply what they learned and play the simulation again. Transformational Change Leadership Workshop (Two-Day) Ideally suited for launching change teams – or for getting them back on track. Attendees participate in the ExperienceChange simulation on Day One with 45-60 minutes of debrief at the end of the day. On Day Two, they will apply what they have learned to their own change initiative. Establishing a shared foundation of trust on the team, so that every member can bring their best self and best thinking to the team. Developing guiding principles to turn destructive conflict into sources of innovation. How to turn finger pointing and blame finding into a culture of personal accountability.